THE owners of a Camden Town pub popular with celebrities and locals spent the weekend at Glastonbury encouraging festival-goers to sign a petition calling for their bar to be saved. 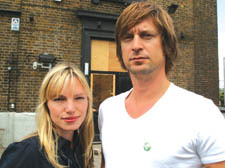 Ruth Mottram and her partner Doug Charles-Ridler, who run The Hawley Arms, have been told they have until tomorrow (Friday) to sort out plans for the Castlehaven Road pub destroyed by the fire that swept through part of Camden Market in February. An earlier set of designs presented to Camden Council were rejected because of proposals for a staircase at the back with a glass-fronted wall. Ms Mottram and Mr Charles-Ridler took a banner to the Somerset festival calling on fans to “help save the Hawley” and expected some of their starry customers to join the campaign. Mr Charles-Ridler said of the council’s rejection of the plans: “I’m gobsmacked. They’re happy for people like us to keep Camden cool, they love all that.” The stairs at the back of the pub are seen as necessary to retain enough floor space to keep the business viable. Fire regulations mean the stairs cannot remain where they were before the blaze.